Who knew Harley Quinn was such a mistress of disguise! 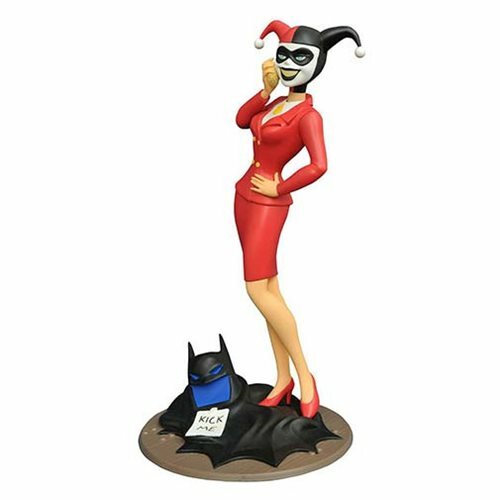 This PVC statue, based on Batman: The Animated Series, shows a suit-wearing Harley Quinn re-applying her make-up after going undercover as a lawyer in the classic episode, "The Man Who Killed Batman." At her feet lies Batman's cape and cowl, with a "Kick Me" sign stuck to the back. This 9-inch scale PVC statue features high-quality sculpting and paint applications, and is in scale to all Gallery and Femme Fatales PVC statues (sold separately). The Batman: The Animated Series Lawyer Harley Quinn 9-Inch Gallery Statue comes packaged in a full-color window box. Ages 13 and up. Move Over Boys, And Make Room For Harley Quinn: Attorney Against Law!